The character of Sgt. 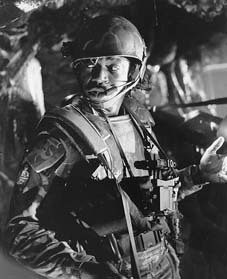 Apone was played by Al Matthews. This costume has been pieced together by me over the last few years. Each piece was obtained from a different source and had to be meticulously researched. It is known from various sources that there were three sets of armor made for each character. The armor was made from aluminium by Terry English following designs provided by James Cameron. One partially complete "Armored Combat Uniform" for Apone was sold at the 1987 Bonhams "Film Costumes and Military Uniforms" auction. Whilst this costume was missing the leg armor, some parts of other characters costumes were mixed up. At the same sale another helmet and at least two BDU's for this character were sold. A second set of body armor for this character was on display at "Alien War" in London, England from 1993-95.